This is a birthday gift for a friend's child and I can only imagine how much fun will be had under this tent! 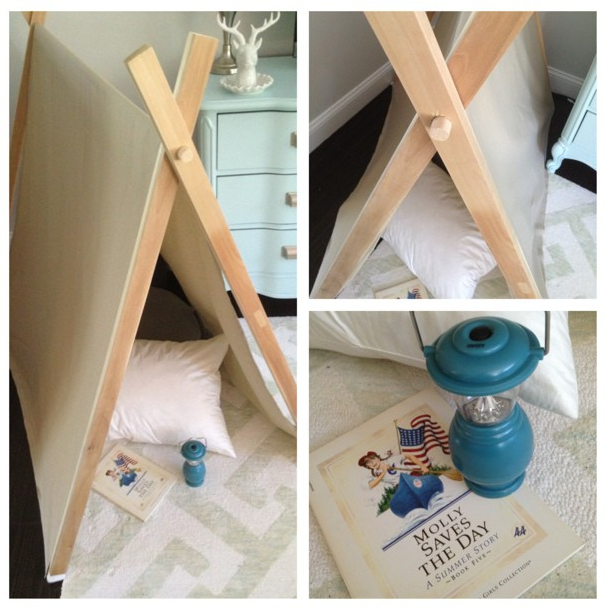 It was really easy to make...you only need 4 pieces of wood for the 'legs', a dowel for the top, a twin-size sheet, and some elastic! I used a tutorial found here to make the tent but added an extra step: To prevent the legs of the tent from slipping if used on a wood or laminate floor, I sprayed the bottom inch of each leg with Plasti-Dip (found in the spray paint section of Home Depot) which adds a rubber coating! Now it doesn't slip! I also used a fine grit sand paper block to smooth each of the four legs to prevent splinters (which isn't mentioned in the original tutorial). I can't wait to see a little face light up when this gift is opened!